Paw Talk - Pet Forums > Rodents > Mouse & Rat Discussion > Memory Lane! Feel Free to Contribute! I know I've posted this kind of thing elsewhere, but I'm feeling nostalgic about my furbabies this week, and anticipating the arrival of my new kitlings as well. So I thought I'd walk down memory lane with you guys. Feel free to comment or add your memories of your own rodent furries. Let's celebrate our babies. In 2009, I decided I wanted to try owning rats for the first time. After much research and contact with a rockin' breeder named Amy, I awaited my first three boys. They came home to me the first week of March 2010. Three 'creepy' smudgy black baby brothers that I named The Alabama Ghostboys. Windham (back corner) was the shyest and yet grew to be the biggest of the bunch. His catchphrase was "There's Nothing to Fear But Monsters." He stayed with me 9 months before a mystery neurological paralysis took him from us too soon. Jeffrey (dumbo to the left) grew to be a scruffy Indiana Jones explorer rat. He was mentor later in life to the next generation of baby rat that came into our home. He left us in the spring of 2012 at just over 2 years old when a benign but poorly situated bone tumor took him from us. His theme song was straight from The Stones "Jeff-REEE he does what he likes, any old time!" Tucker (right hand boy) was Mr Godfather. He was amiable and confidant and commanded respect his whole tenure of The Cage. Later in life, HED scarcely slowed him down. We'd always sing: "Get out the way of old man Tucker, he's too cute to miss his supper." He lived to a ripe old age of 30 odd months, and left us in his sleep cared for by the next generation. Our next generation came to us December 2011. I fell in love with hairless rats, so broke my cardinal rule of BYB purchase and brought home the two stinkiest, ornariest, gummy beariest, street urchins I could find. Blind Melon and Lynyrd Skynyrd, aka Melon and Skinner were my happily married gay couple who were devoted to each other and no one else. Life was nothing if not exciting with them. They were fun, annoying, and always entertaining. We lost them both January 2013 when our air unit malfunctioned while we were away. At the same time we adopted Melon and Skinner, we also brought home the Ghost Boys' younger half brother Black Pete, a tiny little dot of a baby who was the most discriminating and sweet gentleman I've seen. He grew into a giant solid block of a rat. He had a devoted Bromance with his idol Jeffrey, and eventually took over as Lovefather after the exit of other brother Godfather Tucker. He loved few but loved devotedly, and left us too soon along with the hairless twins January 2013. Arriving with Petamungus, came a pudgy, and roly poly Poster Boy For Ratty Goodness we named Zmei. He was a handsome BES satin boy and was the Gomez of the rat world. He would kiss you from shoulder to fingertips. He was arm candy and my biggest heart rat ever. He would also brass knuckle his own mother for some corn on the cob. We lost him far too soon at 18 months to myco. The third generation came in the summer of 2012. I was asked to take in and love some of breeder Amy's gals as she'd developed a severe rat allergy and could use some help with someone she trusted to keep some of her retired breeders to get her numbers to an allergy friendly level. I became guardian to a rainbow assortment of five girls I dubbed the Skittle Girls. First was Custard. Zmei boy's half sister. A delicate featured pudge of a BES satin girl cut from fat boy Zmei's mold. She was a surrender who'd come back to Amy having been kept isolated from other rats. Custard was terrified of all rats, but Black Pete fell in love with her on sight and spent the rest of her life winning her over. We lost her after a mere 4 months due to multiple aggressive tumors complicated by Myco, but in the time we had her, it was like having Zmei back with us again, because while she hated other rats, she loved us with a silly, licky, passion. Second was Zanna, a litter mate of my darling Zmei. A burmese satin dignified older lady who after he lost his lady love Custard, took Black Pete into her heart and made him feel safe. I loved the three 'Mese rats so much. Their personalities and looks were exceptional. Though they were the only two litters bred of this line and quickly discontinued because of the multiple health problems that cropped up, I wish all rat lovers could have rats blessed with their personalities. We lost lady Zanna with Black Pete and the hairless brats in January 2013. Along with Zanna, came cagemates Darcy and Devon. Darcy, my dumbo russian blue velvet hunka happy go snuggly rat girl. She's cheeky and loves to escape the cage given the opportunity, but is the most pancaking mellow rat in the world. She loves everyone and everything, and loves hanging out with people. My son is devoted to this little girl, and she helps him do his homework every day after school. Darcy, seen here contemplating a cage break. Devon is a russian blue dalmatian lady who is an unashamed wheel addict. She is four months shy of her third birthday, and is only just now losing her wheely tail to HED. She STILL walks her wheel every morning. She is shyer and discriminating, but has chosen me as her special friend. I adore her and her face boomerang so much. I will cry big tears when Darcy and Devon go to the Land of New Feetsies. Rat number five is has become my labor of love. Black Aggie came to me a special needs head tilt girl who, like her uncle Jeffrey, is the ultimate explorer. She is by far my cleverest rat. There's little she can't figure out in a heartbeat. She's stand offish but every bit as entertaining and busily on the go as my hairless brats were. We've had recent health scares with her revolving around her ear and abscess issues, but we've got high hopes she'll be around for a long time yet to come. Aggs is also known for her posing skills. I'll also include pictures of the three rats coming home to me soon. In another week I'll be bringing home my first true rescue adoptions. He is a neutered mink berk male with a sweet, but somewhat quiet personality. He is described as a PEW neutered boy who is outgoing and loves attention. Their story broke my heart and made me determined to bring them home. They were purchased from a feeder bin as part of a 'prank' by a college student at a major university down the road from us. This stellar example of Future Leaders of America first let them loose in a girls dorm to scare some co-eds. When they escaped death by screaming foot stomping, he re-caught them and then hooked up with some of his fellow classmates for session of lots to see who would have the privilege of dispensing a wheel of misfortune style chosen method of gruesome end for these two little terrified rats. Fortunately, a fellow classmate, much more compassionate and of real leadership potential came forward and read this crowd of bozos the riot act, claimed the two little rats, and kept them safe until they could be delivered to the Rat Rescue. I'm also taking home a girl whose first adoption fell through, but who caught my attention with her personality. She is a feisty take charge hormonal girl who is begging for a home. Her belly spot, petite size with huge personality, and her potential as Future Library Diplomat Rat for my job caught my attention. Because of her big personality, I've already named her Clara the Impossible Girl. Me oh my, I am in heaven reading your trip down memory lane, Story, and what a trip! Just about cried (in a good way, I promise!) seeing all the old loves of your life and remembering so many wonderful stories about each of your sweet bubs! Melon, Skinner, Black Pete, Zmei, Custard, the original ghost boys, oh, the wonderful images that come to mind. That first photo, showing the Ghost Boys looking soooo teeny tiny...wow. Just melted me. And your new Skittle girls...just dolls....and how sweet and precious that your son adores Darcy so much...awwww! She sounds like such a love! Fantastic post and it DOES bring back so many happy memories.......if I was to comment on each and every bub and all that I remember of them, my post would be about 4 pages long, ha ha. Well, you have started a great thread and now I will need to start working on my own trip down memory lane to try to at least do your post some justice and contribute! For now I guess it is off to the archives for photos of my sweet boys from the good ole days. Okay, Story started a great "Walk Down Memory Lane" thread so here is mine. 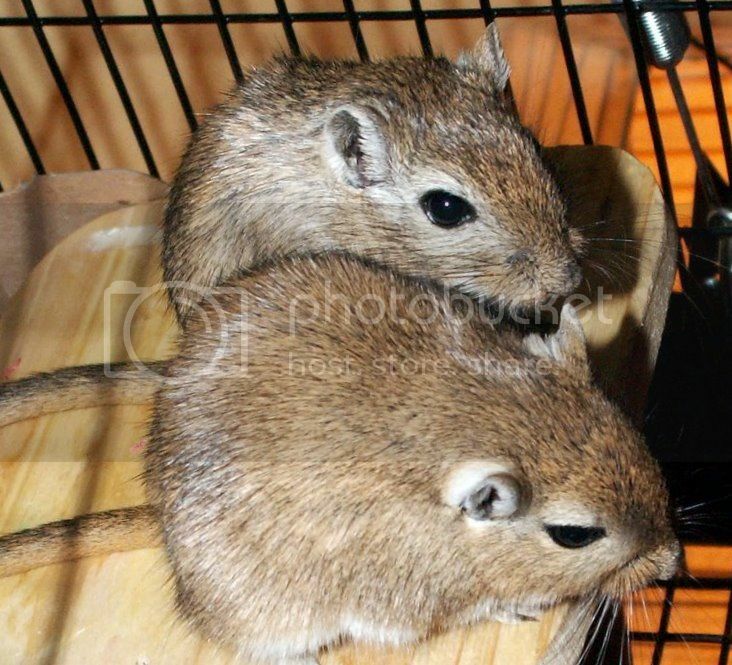 The first two bubs Marc and I ever had after we married was a pair of beautiful gerbil brothers, both agouti, named Mick and Keith, after the famous dudes from the Rolling Stones, of course. They were our sweet loves and best gerby-gerbs anyone could ask for. We adopted them when they were babies, from a Petco in the days of old, before we knew any better. They were, of course, spoiled rotten and we loved them soooo much. We had so many wonderful times with our boys, including birthday parties, snuggle times, kisses and scritches, play time on the bed, sleeve rides, dust baths, Christmas fun and so many other moments. Down the line, Mick unfortunately developed a tumor in his tummy and since he was already getting up there in age, our small animal vet (the same Dr. Kamaka who later became our wonderful ratty vet) said the trauma of surgery would be dangerous and too stressful for him so we jointly decided not to put him through that, especially since he was comfy and not in pain. We let him live out his last few months happy at playing at home with Mom and Dad and Keith. Here is Mick with his pear shaped looking tummy after the tumor showed up. Still a happy perky boy though. 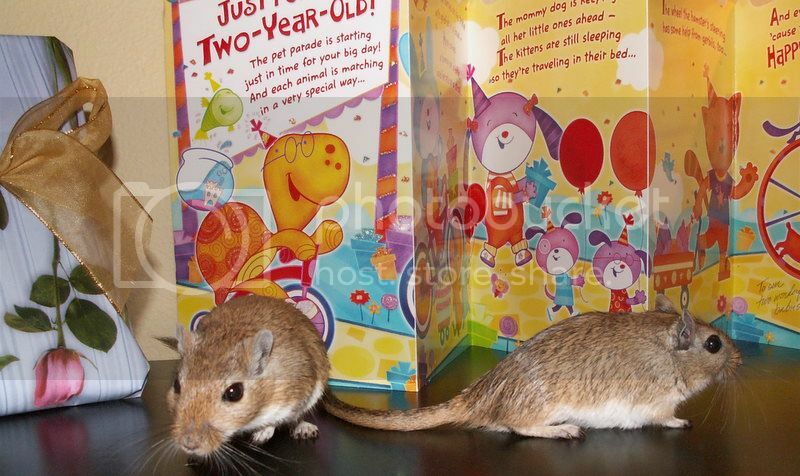 Both of our boys made it to their two year birthday, complete with birthday card and wrapped presents, but unfortunately, Mick passed away one night a few months before his third birthday. His brother Keith made it to three years old, and finally one night he got very wobbly and lay down on his side breathing hard, and Marc was there to comfort him with soft strokes and cuddles with his hand, and tell him it was okay to go see his brother. I was nearby, unable to watch and bawling my eyes out as I knew he was getting ready to leave us. Keith only breathed hard on his side for less than a minute while Marc comforted him, and then he was gone. Marc and I both cried for weeks. We will see you at the bridge my sweet ones. Play hard. We love you. Last edited by Vladina; 06-16-2013 at 10:01 PM. I thought for my ode to Klausse and Wolfgang, I would re-post the memorial that I made for them many moons ago, as the photos are still my favorites and the descriptions of their wonderful and very different personalities are still the same of course! Feel free to bypass the sad parts about their passing if you want to have happy thoughts, and enjoy the captions. Love you boys soooo much! I think of you all the time. Mom and Dad will see you again someday! 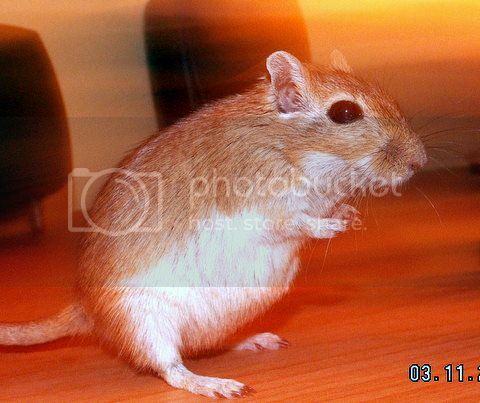 Vlad, this is the first time I recall seeing good pictures of your gerbil boys and hearing their stories in one place. I've always loved gerbils. I've had a couple and we raised some at my work place as part of a project by my animal loving outside the box boss. They're such escape artists, and silly personalities. Your boys big eyes and ickle feetsies....so adorable! It's also rare that they live three years! It shouldn't surprise me as wonderful as you are to all your babies. It was so wonderful you were able to send Keith on at home and be by his side. I know it was hard, but you can't ask for a better send off. Thank you for sharing this sweetie! Aww, thanks so much Story! I am so pleased that you like my story and photos of my gerbie babies. We did love them so much. They were just sweethearts, and yes, we do have their ashes in two little forest green earthenware urns, plus their framed pictures are all over our house, along with Klausse and Wolfgang's photos. We never forget our babies. P.S. on Keith passing away at home with Marc by his side...yes, we were at least comforted knowing that he was able to pass away at home with both of us present. I wish so bad that it had been that way also for Klausse and Wolfgang. So those are the lovely newbies!!! Lucky lucky rats!!! I cannot wait to hear my stories about them. @Vlad: They really were adorable little nuggets! And that's right! My bad. Marc really is so awesome with all animals. @Lilspaz: The new kids are settling in in stages. My sweet Aggs seems to have stabilized again after her abscess infection. We had it surgically removed and she has rallied after the recovery. We're watching her closely. I had one vet who refused to remove it, felling it was pointless. I had another say it will likely come back. And I also had her breeder say often abscesses can have an underlying cancer source. But right now, she's trucking along. She's never liked hands, and of course with her balance issues she wouldn't. So it's hard to handle her even to this day. I was making progress with her until I had to medicate her daily. She's smart enough that she can tell if I'm sharing strokes and snacks or if I'm needing to pick her up. She's a ninja at avoiding hand contact and I have to be extremely careful when I have her because she's apt to leap from my hands. But I love her and don't blame her. That's sweet i like the white furred one and the grey and white one the most. I also have 2 gerbils.